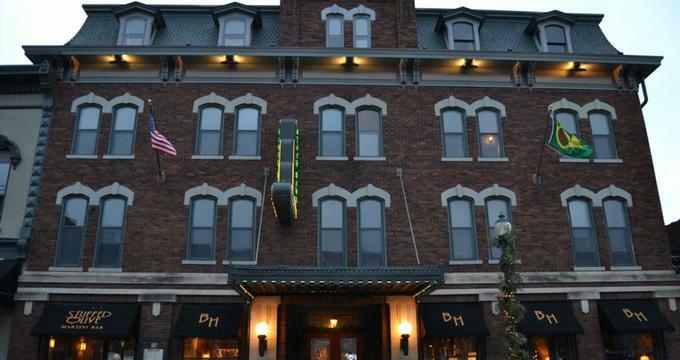 Dating back to 1915, The Blackhawk Hotel in Davenport, Iowa is a historic landmark hotel that has been offering stylish accommodations, upscale amenities and gracious hospitality for visitors to Cedar Falls for over 100 years. Situated a few miles from the Rock Island Country Club and the Vander Veer Botanical Park, the luxury hotel features chic guest rooms and suites with contemporary décor and modern furnishings, private bathrooms, and upscale amenities. Upgraded suites have fully equipped kitchenettes with washers and dryers, bathrooms with whirlpool tubs and private balconies with stunning views. First-class facilities at the hotel include an exclusive spa and salon, an indoor swimming pool and hot tub, a fully equipped fitness center, a restaurant, lounge and café and a bowling alley and full service bar. A complimentary shuttle is available for guests, and the hotel is within walking distance of the many shops, restaurants, bars, and nightlife on the Main Street in downtown Cedar Falls. The Blackhawk Hotel offers two distinct types of accommodations, namely beautifully appointed guest rooms and suites in the lovely historic building of the central hotel, and more contemporary and affordable accommodations in the MobileDigs building behind the hotel. Deluxe accommodations in the main building of the hotel range from standard guest rooms to one, two and three-room luxury suites furnished with period antiques and king or queen-size pillow-beds dressed in high-quality linens and down comforters, and plush pillows. Spacious en-suite marble and granite bathrooms have Jacuzzi tubs with a complimentary rubber duck, spa rain showers, single vanities with lighted make-up mirrors, plush towels, and bathrobes, and Tarocco toiletries. Sitting areas have work desks and ergonomic chairs, and modern amenities include individual climate control with cooling and heating, flat-screen televisions with cable channels, telephones, wet bars with beverage centers, hairdryers and irons and ironing boards, and complimentary wireless Internet. Directly behind the main hotel building is the MobileDigs building which has been designed to echo that of a 1970s ‘motor lodge’ for travelers wanting comfort, convenience, and affordability. The building features 15 newly renovated guest rooms with sleek platform king-size beds dressed in high-quality linens and comforters, and plush pillows, and en-suite bathrooms with showers, single vanities, fresh towels and branded bath products. Modern amenities include individual climate control with cooling and heating, flat-screen televisions with cable channels, telephones, wet bars with beverage centers, hairdryers and irons and ironing boards, and complimentary wireless Internet. A complimentary continental-style breakfast is served every morning in the elegant dining room and includes freshly baked bread and pastries, seasonal fruit, cereals and homemade granola, yogurt, fruit juices, freshly brewed coffee, and tea. Gluten-free, lactose-intolerant, vegetarian, and vegan diets can be accommodated on request. Upscale amenities, facilities, and guest services at the Blackhawk Hotel include an exclusive spa and salon, an indoor swimming pool and hot tub, a fully equipped fitness center, a restaurant, lounge and café and a bowling alley and full service bar. A complimentary shuttle is available for guests, and there is free gated parking and high-speed wireless around the property. The Blackhawk Hotel is an ideal base for enjoying all the outdoor activities and recreational pursuits the Cedar Valley has to offer, ranging from hiking, mountain biking, horseback riding, and kayaking to cross-country skiing, ATV riding, and fishing. The nearby University of Northern Iowa Campus also hosts a variety of arts and cultural events throughout the year. The Blackhawk Hotel is situated within walking distance of the many shops, restaurants, bars, and nightlife of the Main Street in downtown Cedar Falls, as well as just a few blocks from the University of Northern Iowa.